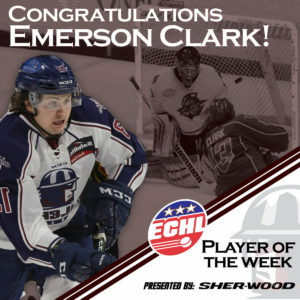 PRINCETON, N.J. – Tulsa Oilers forward Emerson Clark has been selected as the Sher-Wood Hockey ECHL Player of the Week for Oct. 17-23, as announced by the league Tuesday. Clark helped the Oilers to a 3-0-0 record during the club’s 65th Home-Opening Weekend, posting three goals and four assists for seven points in the three games. The Whitby, Ontario native tallied two assists in a 6-1 win against the Indy Fuel on Friday, scored a goal and the only shootout goal in a 5-4 shootout win against Atlanta on Saturday and factored into the scoring on all four Oilers goals (2g-2a) in a 4-3 overtime win against the Gladiators on Sunday. The 23-year-old Clark is tied for second in the ECHL with seven points in four games this season. Clark has recorded 79 points (42g-37a) in 157 career ECHL games with Tulsa, Greenville and Toledo. He has added seven points (2g-5a) in 29 career American Hockey League games with Chicago, and signed an AHL deal with the Wolves in the off-season, earning the chance to participate in the St. Louis Blues’ NHL camp. Prior to turning pro, Clark posted 44 points (26g-18a) in 210 career games in the Ontario Hockey League with the Oshawa Generals and Windsor Spitfires. On behalf of Emerson Clark, a case of pucks will be donated to a Tulsa youth hockey organization by Sher-Wood Hockey, the exclusive puck supplier of the ECHL. Since beginning its sponsorship of the award in 2000-01, Sher-Wood Hockey has donated more than 35,000 pucks to youth hockey organizations in ECHL cities. The Oilers face the defending Kelly Cup Champion Allen Americans tonight at 7:05pm at the BOK Center. It’s the first of 13 meetings between the two Western Conference rivals. Tulsa then hits the road for games against the Indy Fuel (6:35pm Friday) and Quad City Mallards (7:05pm Saturday). All Tulsa Oilers home and away games for the 2016-17 season will be broadcast on www.tulsaoilers.com via Mixlr, by clicking on “Listen Live”, or via the Mixlr Mobile App. Fans can also watch the games all season on ECHL.TV, powered by Neulion.